It has been about a week already since we have discovered the new Markets CX LTC cloud mining service and have started testing it. We have decided to give it a try as it was new and interesting, so we have invested 5 Litecoins to purchase about 120 KHS worth of cloud mining hashrate at a price of 0.0410 LTC per KHS. Initially we’ve had some concerns about the service that is claiming to be using Gridseed ASIC devices to provide so attractive prices for cloud mining hashrate as compared to other services that are still using GPUs. 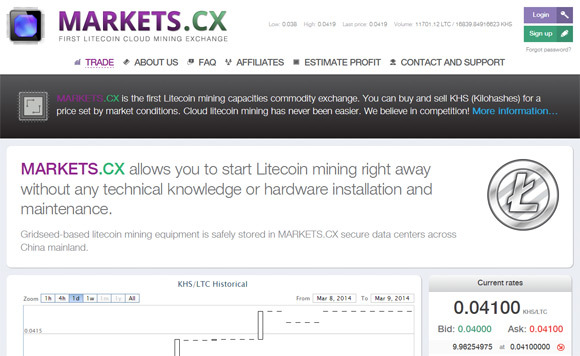 You can check our first impressions from the MarketsCX Litecoin cloud mining service and see some of the concerns and issues that some readers that have decided to try it out as well have reported. Guys, indeed there were some technical problems a few days ago. Some user accounts with dots and uppercase characters in their E-mail addresses were affected. We have successfully solved this problem. No LTC, KHS or mining profits were lost. It is nice that they are keeping an eye on what other people are talking about their service and taking the time to respond to users with issues that are not posted on their website, though their onsite support seems a bit slow in responding apparently. Up until today we’ve had no issues with the service so far, and today was a bit of a delay when we have requested an LTC withdraw – we did not receive a confirmation email shortly after requesting the withdraw (previously we got it in less than a minute). So we’ve sent a support ticket about the problem and have requested multiple times a withdraw to test if we are going to receive an email. A bit more than an hour later we got a confirmation email and the withdraw was completed, so we’ve closed the ticket (we got no answer, but maybe the issues was addressed). So a few more hours later we’ve requested another withdraw to see if the problem with the delay still exists. Again we did not get a confirmation email within a few minutes, but requesting the withdraw again and we got the confirm email in a moment (again just one with two requests made). 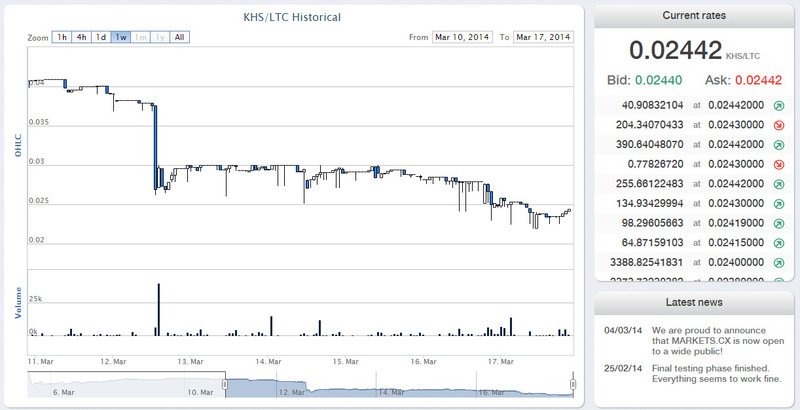 Another thing that we did not like much about the service is the rapid decline in price per KHS, we have purchased hashrate just a week ago at 0.0410 LTC per KHS and back then this was very reasonable price and now the price is 0.02442 LTC per KHS. We are not sure if this is because of users that are dumping their hashrate or by the service pushing new hashrate at a lower price, but we are not very happy that in just a week time our hashrate lost almost half of its value (a common problem with cloud hashrate services with trading exchanges). Currently there are more than 34 MHS worth of hashrate available on the exchange, so at the moment you can buy some cheap LTC mining hashrate. We do recommend caution though as this is still a new service and we still do have some concerns, so not a good idea to invest a lot of Litecoins in it for the moment. 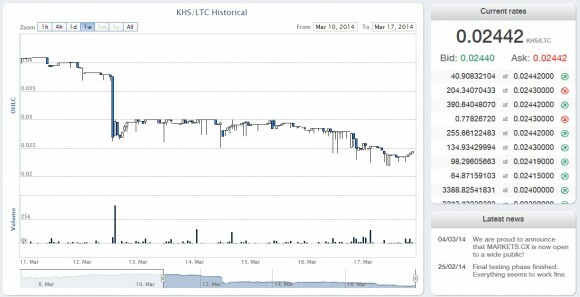 If you are interested in checking it out you can get with a few LTCs like we did, as it is probably not a good idea to invest in thousands of KHS for the moment! If you were looking for the Litecoin alternative of the CEX.io Bitcoin cloud mining and trading service then you may not have to wait much more. We have just found out about a new service that looks and functions very much like CEX, however it is designed only for LTC cloud mining. This new service that has launched just a few days ago is called Markets CX and has started just about a week ago with a month before that for closed beta testing according to the available information. It seems that the service is based somewhere in Asia and to be more precise in mainland China according to the not so man details published about the operation. Furthermore the cloud mining hashrate being offered is apparently provided by 5-chip Gridseed ASIC devices and there is even an option to redeem your cloud mining hashrate for actual hardware (300 KHS per device). Of course we have decided to give the service a try as something new and interesting in our search for a good Litecoin cloud mining service. It seems like the most promising and well made from what we have tried for mining Litecoin, so we have decided to start by depositing 5 LTCs and purchasing Scrypt mining hashrate with them. We started with 1 LTC initially just to test and soon after that moved another ~4 Litecoins and the total hashrate we have purchased with them was about 120 KHS. We liked that the deposit confirmations require only 3 confirmations on the network, so you can quickly have the LTCs available on the exchange to buy hashrate with. The current price per 1 KHS is 0.0410 LTC with already over 40000 KHS (40 MHS) available on the exchange, so there is plenty of hashrate available for sale at the moment. We however do recommend to start small as we did and we usually do with new services that we are trying out and if everything works well out for you you can later on buy more hashrate. The good news is that we already got a few hourly earnings credited to our account and we can withdraw them, though we’ll probably reinvest them for more hashrate. We expect that soon the exchange rate will start to get higher as currently the available on the market KHS are probably offered by the service provider at a lower rate and with more demand the price will start to get high. This will allow you to buy now cheaper and sell more expensive later on to get some extra profit if you do not want to invest on the long run. And while this new service for LTC cloud mining does seem to look very similar to CEX.io the two are not run by the same people. This new Litecoin cloud mining platform does not yet have a public mining pool where you can mine with your own hardware, or even some real time information about what and how your purchased cloud mining hashrate is performing. For the moment you can only see every hour what your earnings are on the account Balance page, so there is more to be desired here, especially considering that this piece of information is not well described and you need to figure it out by yourself. 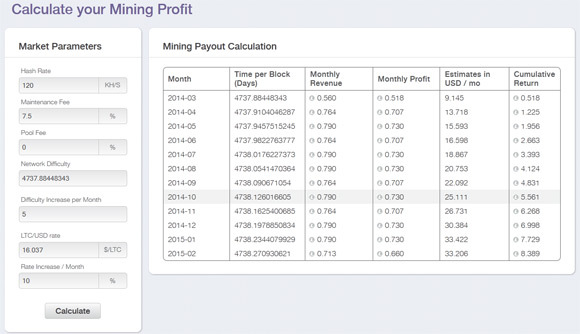 Markets CX does offer a Mining Profit calculator that can give you an idea about when you can expect to break even in. The average return of investment according to the profit calculator is 6-7 months and that does sound pretty good, but the time required to get your invested LTC back can vary. The maintenance fee for the cloud mining hashrate you purchase is currently 7.5% and you can see how much from your earnings are deducted each hour when you get your mining profit credited to your account. So far we are excited by the potential we see in this Litecoin cloud mining service, so we do recommend to take a look at it if you are interested in LTC cloud mining. 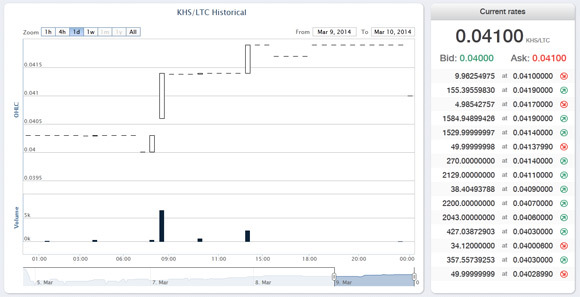 You can try it out with just a few KHS like we did and we’ll keep you updated on our experience and results from using this new Litecoin cloud mining and trading service. Note that we do recommend to proceed with caution though and not invest a lot of coins initially and give the service some time to prove itself first!